Everyone loves Bass, let’s start with that. And, if you are reading this post, then it means you are one of those persons who keep Bass on the top of their priority list when going for a pair of headphones. But, not every pair of headphones is bass heavy. A user has to do a lot of research to find out the best bass headphones for themselves. Luckily, you don’t have to do any research, because we have done it for you. Today, we are reviewing the 10 best bass headphones. The list comprises both the wired and wireless headphones that are ideally designed keeping the bass lovers in mind. 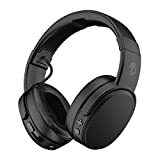 These are one of the best wireless headphones manufactured by Skullcandy, that come with an insane battery range of 40 hours. The drivers on these headphones come with two additional subwoofer drivers that help in delivering great sound with powerful stereo haptic bass. Oh, and the headphones also come quick charge technology, which means you can get 3 hours of music playback on just 10 minutes of recharging. Isn’t that amazing? Wireless headphones that run on Bluetooth. Full range 40mm audio drivers. Comes with two additional subwoofer drivers. Built-in microphone and on-ear control buttons. 40 hours of battery range on a single charge. Comes with rapid charge functionality. 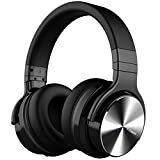 These are a wireless pair of headphones running on Bluetooth that offer a standard connectivity range of upto33 feet. This is another reason to go for these headphones since all of the users nowadays are moving towards the wireless tech. We would start with the feature or better say the specification, that we love most about these headphones i.e. the battery range. The manufacturer has packed in a really powerful battery that can provide almost 40 hours of backup on a single charge. The better part is that they do not take a lot of time for them to be recharged. With quick charge technology integrated into them, it would only take 2-2.5 hours to charge them completely. This means that an average user can use these headphones for a whole week just on a single charge. The design of the headphones is not something we would referer to as special, but it’s sturdy. The headphones are available in two colors: All matte black in color with gray color branding on the headband which is unnoticeable and the second variant comes with a color combination of white, gray, and brown color. The memory foam used on the drivers is not just comfortable, but it also helps in noise isolation. They give a feeling of noise cancelation, while in reality its just passive noise cancelation. On the headphones, you get the controls buttons for skipping/changing tracks, controlling volume and answering/rejecting calls. Taking calls is made possible with the high-quality microphone that is integrated into the headphones. Getting into the audio quality part, we think you would be extremely satisfied with the audio and bass quality on these headphones. When it comes to high, mids, and lows, the Skullcandy crushers excels in every aspect. The bass slider on one of the driver come like a treat for bass lovers, it allows you to adjust the bass intensity as per your preference. Excellent battery range of around 40 hours. Earcups provide great noise isolation. An ideal pair of wireless headphones for users who love bass . The price point is very effective and would not make a dent in your bank account. The sound quality is pretty impressive too. The thing that all the users would love about these headphones is the battery range and quick charge technology. Sony is known to be one of top brands in the audio industry. It has always given some of the astonishing products to the market including speakers, headphones, mobile phones etc. Sony Mdr-Xb950Ap are premium, lightweight headphones that come with some extra bass. The headphones are available in single color: Black. Acoustic bass booster for incredible bass performance. 40mm around the ear drivers. Durable body built of aluminum and plastic. In-line microphone to take the calls. Very lightweight overall: 8.64 ounces. The 950AP headphones from Sony would be perfect for users who don’t want to spend a lot of money on good bass headphones. The acoustic bass booster in the headphones allows every user to fine-tune the bass level as per their preference. If you have used any of the MDR headphones in the past, then you will find out that the design and overall look of the headphones are similar to other headphones from the series. The body is build up of aluminum and plastic, aluminum makes the body very durable and also very lightweight at the same time. You get cushion padding on the inner side of the headband and on the drivers. The padding feels soft and does not feel punchy at all. You can surely use these headphones for multiple hours without any issues. The bass on these headphones is definitely richer than most of the headphones. It’s not as hard as 9650BT, that has a dedicated button to Boost bass, but it is still very good. Do not buy them if you are looking to get moderate bass and not a type of bass that makes your head vibrate. Talking about sound quality is really loud and accurate. If you are the type of listener who likes to listen to music at very loud volumes then you will definitely like them. The overall sound experience along with powerful bass is awesome. The best thing is that even though the bass is so powerful, you still get to hear the vocals very clear. There is no sound distortion. The only thing that we missed in these headphones, and other users will also miss it, is the presence of Volume controls buttons. You get a button on the headphones, but that’s just for changing tracks, you can not control the volume with it. Comfortable padding on headband and earcups. Acoustic bass booster with powerful bass. With these Sony headphones, you will get a realy powerful and hard hitting bass experience. The one single issue with them is that they don’t come volume control buttons, you would have to do that from the mobilephone itself. Rest everything including the price tag is great. These are wired headphones that come with really high-quality framework. Audio-Technica is one of the best headphones brands in the market. Recently, their ATH M-50X got featured as Editor’s choice headphones in our list of best studio headphones. The ATH-WS11ooiS are wired headphones that feature 53mm deep motion, high-res audio drivers. Bass venting system for an enhanced bass experience. In-line controls and in-built microphone. Robust body built of aluminum and plastic. Dual layer earpads provide great noise isolation. Uses 3.5mm jack for connectivity. High res sound reproduction, decent bass, and great noise isolation, there are few of the things you would absolutely love about these headphones. The design of all the Audio-Technica headphones is great. It’s not fancy but it’s still great. With these particular headphones, you get most of the part in either black or dark gray in color with silver color branding on the front side of the drivers (something that we encountered in ATh-M50X and 40X). The body of the headphones is made up of the combination of plastic and aluminum and is very rigid in nature. The robust body features aluminum centerpiece and aluminum stabilizer that cuts out unwanted vibration, providing an even better audio experience. The headband has padding on both the sides which provides great comfort to the head. The drivers on the other side come with dual-layer earpads, that consist of a firm internal padding and soft outer padding, which not only provides great comfort to the ears but also helps in providing excellent sound isolation. The headphones come with all the controls like play/pause, answer/reject calls, change tracks etc on the in-line remote that is present on the detachable 3.9-foot cable. You also get an in-line microphone on the cable itself. Getting into the sound experience part, the headphones feature a very powerful magnetic circuit that helps in producing accurate audio with wide frequency response, while the large 53mm of surface area in the drivers gives enough room for air movement, producing decent bass. 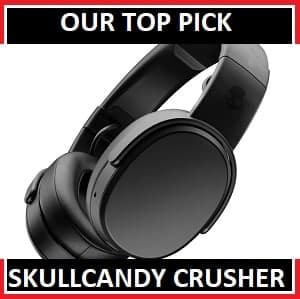 If we compare them with the Sony headphones and the Skullcandy crusher mentioned above, then the bass would not be very strong, but that doesn’t mean its not good. It’s good, but not something that would shake you up. If you are a real bass head, you will surely feel like they should have more punch. Large 53mm drivers with enough room or ears. Deep motion Hi-Res audio drivers. Rigid and comfortable build quality. Earcups create really good noise isolation. Dent bass, not very punchy. If you are a fan of Audio-technica headphones like most of the people are, then these headphones could be a great deal for you. The manufacturer has integrated great audio mechanism in them, so that the user gets an excellent overall audio experience. Sennheiser is known as one of best manufacturers of premium headphones. 630VB are audiophiles grade headphones from them that come with a collapsible design. The build quality and the overall look of the headphones is something that everybody would admire. The headphones are designed for mobile phones, but since they are built wih high-quality mechanism, they can be used with home theater systems as well. Closed back around ear design. Integrated control buttons on the front of earcups. Durable and comfortable build quality. Rotatory dial for controlling bass. Comes with In-line microphone to take calls on the go. 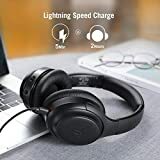 Since they are professional grade headphones, designed by one of the most popular brands in the market, they do not come at a cheap price point. But also, every money spent on them is totally worth it. The framework of the headphones is very robust. You would see a good amount of aluminum used on the headphones, that makes them very durable. But, that also makes them slightly heavier as compared to other headphones. The overall weight of the headphones without the cable is 14 ounces. The microphone on these headphones is placed in-line on the wire, while the controls are placed on the earcups. On the earcup, along with the control buttons, you also get a rotary dial to control the bass. It helps fine tuning of low frequencies as per the preference of the listener. The bass adjuster would be loved by any every bass lover. You can clearly see the difference when you use the rotary dial. Both the headband and earcups are padded with leather ear cushion, allowing users to use the headphones for longer continuous listening sessions without any discomfort. As said previously, the only thing that’s not great about these headphones is the overall weight and size, that makes the not too good for traveling. They are only good for use at home or studios. Very detailed and powerful sound reproduction. Soft cushion padded earcups and headband. Large in size and a bit heavy. HD 630VB are one of best sounding headphones in the market. The audio reproduction on them is highly detailed, the bass is heavy, and the overall build quality is very comfortable. If you want a pair of great bass headphones for both personal and professional use, then these must be your choice. For those of you who don’t know, Cowin E8 is a successor to the very popular Cowin E7, which is budgeted noise-canceling wireless headphones. Cowin E8 are bass heavy wireless headphones that come with Active noise cancelation technology. The overall look of the headphones is astonishing. The headphones are available in 6 different color combinations with the black color being common in all the combinations. Equipped with Active noise cancelation technology. Soft and comfortable ear cushions. Comes with in-built microphone and control buttons on the driver. Powerful and crisp sound with Hi-Fi deep bass. We would start off the review by saying that these headphones are not tiny lightweight headphones, they are bulky a bit heavy headphones that are not recommended to be used continuously for a long period of time. Take off the headphones every 1-2 hours to get a comfortable experience. The build quality of these headphones is solid and the design is very elegant. On the right headphone, you get the control buttons for answering/rejecting the calls, changing tracks, play/pause, and controlling volume. The plastic used on the body comes with enhanced toughness, that makes the headphones durable and unlikely to break. The driver size is 45mm which could be quite big for some users. But, you need to remember that it’s important for every noise canceling headphone to cover the ear completely so that no sound leakage occurs. 45mm drivers in Cowin E8 are big enough to create a seal around every size of ears and provide a greatly isolated environment to enjoy the music. 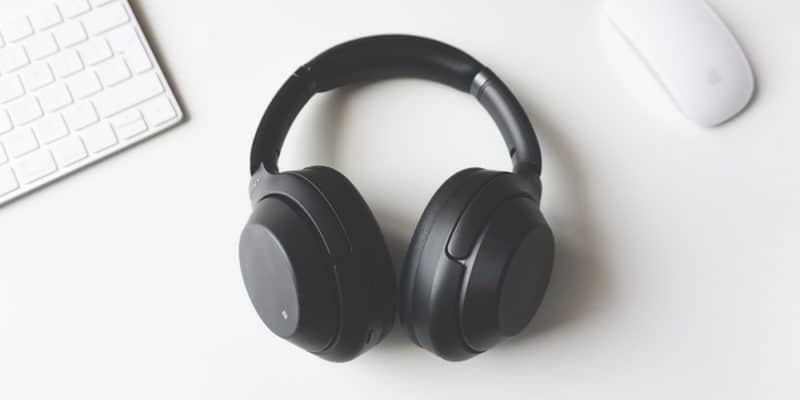 Talking about Noise canceling technology on these headphones, you would be able to eliminate all kind of external noises like traffic noises, airplane cabin noise, office noises, and other distinct noise. One thing that we wish these headphones had is the mode that allows users to hear to the ambient noises even when ANC is turned on. The first time we encountered this feature in Sony MDR1000X and since then we got see that in many other earbuds/headphones. We think every ANC headphones must have that feature. The battery life on these headphones is really impressive. 20 hours of battery range on a full charge is excellent. And that too when in Active noise cancelation is turned on, which is known to be a power hungry technology. The sound quality of the headphones is brilliant. The surprise is that ANC doesn’t affect the sound quality at all. Even with ANC on, the vocals are clear, the bass is punchy and crisp percussion. The overall sound quality is great and loud enough to completely cut your way with the surroundings. Even at the loudest volume, you get deep bass without any crackling. 20 hours of insane battery range. Great audio experience in combination with ANC. Robust build quality and beautiful design. A bit heavy. Can’t be used continuosly for several hours. Apart from them being bulky, there is hardly anything we could complaun about. Crisp sound with deep bass provides a great aduio experience to the user. And the best part is that the sound and bass is not at all affected by Active noise cancelation. If you like to have a cheaper alternatie to Cowin E8, then E7 pro are the headphones you must look out for. Cowin E8 is the upgraded version of E7 Pro, that come with better design and sound quality. But that doesn’t mean E7 pro are not powerful headphones. Cowin E7 pro are wireless headphones that feature active noise cancelation technology along with a battery that can last up to 30 hours on a single charge. That’s actually better than 20 hours that we get in E8 Pro. Comes with two connectivity options: Bluetooth 4.1 and NFC. Over the ear design with cushion soft earcups. Within the past couple of years, Cowin has made a good name in the headphones industry. E7 was their first headphones in the E series. Then they gave E7 an upgrade in terms of design features and launched that upgraded version in 2018 as E7 pro. E7 pro is basically great sounding Active noise canceling headphones with deep powerful bass, that come at mid-budget range. Talking about the design and build quality of these headphones, they are built mainly of plastic and are available in 7 different color option. The built quality looks fine and would not easily breakdown. The headband comes with light padding and the earcups come with soft ear cushion with protein earpads, that makes them comfortable to wear. An LED notification light is present on the front side of the earcup, that notifies if the headphones are connected to a device. On the side of the earcups, you get the control buttons to manage the music and accept/reject the calls. Taking calls is made possible with the help of an in-built microphone. The active noise cancelation of these headphones can cancel almost every surrounding noises. City traffic, office noises, airplane cabin, etc, allowing you to focus on work or music. Active noise cancelation works in both wired and wireless mode. The one thing that we absolutely love about these headphones is the battery range. ANC is power hungry technology, and not all ANC headphones have a good battery range. E7 pro here comes with a massive battery that takes around 4 hours to completely charge and can provide 30 hours of playback time thereafter. Now lets into the sound and bass experience on these headphones. 45mm large drivers on E7 pro crisp and powerful sound along with deep bass. The sound quality is very detailed, which allows you to hear vocals clearly. These are not bass heavy headphones, but you will still get a great bass experience. Excellent battery range of 30 hours. Soft ear cushions for great comfort. If E8 were little too expensive for you, then then E7 pro could be a great alternative. The design is definitely not the prettiest, but the overall functionalities are great. Over a good pair of bass headphones that also has active noise cancelation. Large over the ear headphones from the very popular MDR series that come with some extra bass. The design might not be very comfortable, but the audio quality you get is impressive. As compared to XB950AP, XB800 come with a bigger driver and foldable design that makes them very portable. But, if you ask us which one is better, our answer would be XB950AP. No offense! Superior bass response with direct vibe structure. Portable and compact dual folding design. The only prime reason why these headphones have made their way into this list, and that’s the bass experience. Rest everything is good too, but bass is excellent. So, if you are a bass head, someone who like extreme bass, would surely love these headphones. Let’s start off with how they look. The headphones are built mainly of plastic, and they look nice, but they are not the most durable. But they are surely very comfortable. The ear cushion cups are extremely soft, and every user would love wearing them. The drivers are 50mm in size, which means your ears would be completely covered with them, creating a great noise isolating environment. 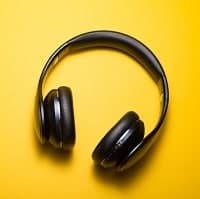 Noise isolation is so great that it feels like noise cancelation, plus there is very minimal sound leakage, which makes them perfect to be used in offices and the library. They got very detailed and nice highs and mids, and excellent bass response. The headphones do not come with any dedicated bass button or rotary dial like we got see in Sennheiser Headphones, which means you can not adjust the bass, but trust us, the bass that comes is perfect and needs no adjustment. The thing would go to the next level if the headphones are connected to an amplifier. When connected to an amplifier, the bass would so heavy, that no one will believe it’s coming out of the headphones. As mentioned earlier the build quality of these headphones is not durable. And the primary reason for it is that the headphones are mainly built of plastic. Looking at them you might feel like there is use metal on them, which is true but only for the metal piece that’s on top, rest everything is average quality plastic. MDR series is a very popular and excellent series from Sony. THE XB800 are bass heavy headphones as similar to 950AP, whih would be loved for all the Bass fanatics out there. If you want a really booming bass, go for them. Taoronics headphones and earbuds have never failed to impress us. The company produces really high-quality, perfectly engineered headphones at a price point that is easily affordable by the masses. BH060 are noise canceling wireless headphones that run on the latest Bluetooth 5.0. Up to 30 hours of playback time on a single charge. Rigid connection with Bluetooth 5.0. Folding design that gets stored away in a sleek case. This is not the first time we got our hands on any Taotronics product. We have tested Taotronics noise canceling earbuds in the past, and they were great. And now, we can say the same for these headphones. The body of the headphones is made up of all-plastic with leather cushion padding on the headband and both the earcups. On the right earcup, you get various control buttons and a jack to use the headphones as wired headphones when running out of battery. The headphones are comfortable enough to use for a long period of time, without any discomfort. The only downside of these headphones is the size of the control buttons. The buttons are small in size, which increases the chances of pressing wrong buttons during the initial days. But once you spend a few days using them, you would be familiar with everything. Taking calls right from these headphones is an absolute pleasure. They feature a CVC 6.0 noise-canceling microphone that helps in delivering clear and distortion free voice calls. Remember, CVC 6.0 works for calls, while the ANC works for music in general. They both are separate things. Talking about the battery, you get an excellent battery mechanism on these headphones. The headphones come with a quick charge/hyperspeed charge, that allows you to use headphones for 2 hours at just 5 mins of charge. The full charge takes around 2-3 hours, resulting in around 30 hours battery range. Noise cancelation works great on these headphones. Definitely not something as you get in high-end expensive headphones, but it’s not bad either. It cancels all the surrounding noises including traffic noises, office noises, airplane can=bin noises, etc. Preloaded with the latest Bluetooth 5.0, headphones create a strong connection with the mobile phone and allows smooth frequency transfers. The sound quality is decent and the bass is average. With that said, looking at the price point and the loads of feature these headphones come with, there is hardly anything to complain about. 30 hours of battery range with a quick charge. 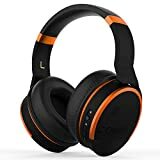 Taotronics always surprises with their affordable headphones. These headphones come with everything a pair of good headphones must have. The sound quality and bass experience is decent, and the heaphones also come with alot of other awesome tech. Price so low and features so good. Tribit Xfree headphones over here are giving a tough competition to all the premium headphones on the market. They come with an insane battery range of 40 hours, Bluetooth 4.1 connectivity and Hi-Fi stereo sound at a very cheap price tag. You can consider these headphones if you are not fond of any big brands. CVC 6.0 Noise canceling microphone. Over-ear design creates noise isolation. Bluetooth 4.1 technology for connectivity. Stereo sound with Rich bass. In our opinion, these headphones are perfect. They sound good, feels good, come with excellent features, and also cost much less than any other headphones. What else does a user want? The design of the headphones is minimalistic and beautiful. The manufacturer has tried to keep it simple, yet elegant. Build of all plastic on the outside, the headphones are available in all black in color with highlights of silver color. The front of the earcups are designed like open-ear headphones, but that’s just the design, they are actually closed back headphones. Along with the design, the manufacturer has done a good job the comfort as well. The headphones are designed with an adjustable band, metallic slider, and soft cushions earmuffs. You also get soft padding on the headband. This allows you to use them for multiple hours without any issues. The design is foldable, which makes it easy to carry while traveling. You also get a carrying case with them, which would keep them safe and easy to carry. The headphones can be used in both wired and wireless mode. 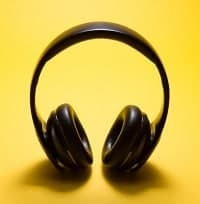 For wireless connectivity, the headphone uses Bluetooth 4.1, which is not the latest version of Bluetooth but still does the job very well. The connectivity range on these headphones is 33 feet. The 40mm large drivers with an extended frequency range offer a great audio experience. The treble is crisp, the sound is stereo and bass is quite deep. As compared to any other general headphones the sound quality would be the same, but in terms of bass, they are really bass heavy. 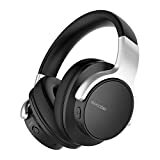 They surely do not come with active noise cancelation, but they definitely offer a great passive noise cancelation, which makes them good to use them in less noisy areas like library and offices. 40 hours of insane battery range. Comes with both wired/wireless connectivity. Strong connection with Bluetooth 4.1 and CSR chip. Stereo sound with deep bass. Getting so many great features in a pair of budgets headphones is very rare. The bass is real deep and heavy, the treble is crisp, and the battery range on these headphones is insane. Must buy for everyone who want to spend less on bass heavy headphones. Mixcder E7 is a pair of budget-oriented bass headphones that offers Active noise cancelation at a very low price tag. The headphones use CSR Bluetooth technology for faster and strong wireless connectivity and also come with a 3.5mm jack to convert them into wired headphones. 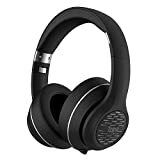 If you plan to go for these headphones, compare them withTaotronics BH060 since both of them come at a similar price tag and offer great technical features. 20 hours of continuos playback on a single charge. Bluetooth 4.0 with CSR tech. On-driver controls and built-in microphone. Adjustable headband and a soft cushion covering on headband and earcups. The headphones might not have the most latest Bluetooth version in them, still, with CSR tech you get a rock solid, instant connectivity with your mobile phone or any other Bluetooth enabled device. The design of the headphones is very basic with some great padding on the headband and earcups. The body is made up of all plastic and comes in a single color combination: black and silver. On the framework itself, you get all the control buttons that are needed to make the music listening convenient. On one of the earcup, you get a play/pause button that also acts as a button reject/answer calls, and buttons to manage volume and to change tracks. On other earcups, you get a dedicated button to turn/off the ANC as per the liking. The headband is adjustable to fit any size, and also comes with soft padding on the side for the comfortable listening experience. The soft protein cushion the earcups allow you to use the headphones for long listening sessions. The Active noise cancelation on these headphones is satisfactory. It can block 80-90% of low-frequency noises that could distract you from your thing. For example, you can cut off traffic noises, noises in a crowded office and also noise coming from the airplane cabin. For delivering high-quality sound, the headphones use 40mm driver, that in combination with CSR tech, ensure great sound quality and rich bass. You get a very detailed an clear sound reproduction, which could be fine-tuned by turning on the ANC. The manufacturer has done a great job on the bass of the headphones, they are definitely bass heavy and are good enough for a bass lover. Good battery range of around 20hours. ANC cancels upto 90% of ambient nosies. These could be one of the greatest bass headphones in budget headphones segment. The bass is deep and heavy, sound is detailed and balanced. The design is very basic, but comfortable for both short and long listening sessions. Oh, and don’t for the ANC that omes along. When it comes to headphones, or audio in general, everyne is fond of using the term Bass. But only a handful of people know everything about bass. Why it’s important for any audio devices? How can I get the best bass experience on my headphones? These are few of the many technical questions a bass lover must seek answers to. When two objects with lower frequencies vibrate together, the bass is generated. One of the best examples of this is a Drum. Since the membrane of a drum is large, it creates slow vibration when hit, hence creating a loud bass every time it’s being hit. Cello, Tuba, Bass guitar are some other great examples for this. In a nutshell, the bass is produced by back and forth moving of an object when it is hit or struck by something. Bass is definitely a very important part of the music. But it needs to be precise. Too much bass can affect the sound output, hence providing an overall and audio experience. Bass basically gives a feeling of thumping or movement/vibration, and it’s too much, music will start hitting you on the head. But, it also depends upon the preference of the listener. Some people actually like bass that would shake them up, while some of the users like light bass. Not all, but few of the headphones in the market come with Bass adjuster, that allows users to fine-tune bass as per the taste.